"I was so glad I found Diversity"
I recently spoke at a monthly church program about the work of Diversity Richmond. It was a very supportive group and we had a great 90 minute conversation that later turned toward religion and politics, two issues strongly facing the LGBT movement. After the program, a gentleman shared that several years ago he moved to Richmond from New York to attend seminary. While riding down I-95, he spotted a building with a huge rainbow painted on the walls. He investigated and fell in love with the thrift store and our mission. While in seminary he also had a private counseling service. One of his clients was a young woman struggling with her sexual orientation. He visited Diversity Richmond and located Side By Side (at that time the organization was ROSMY) and referred his client there. Since that time he has led several young people to Side By Side. Connecting people with resources is something we do often. And how good it is to have such a strong community filled with good people and solid organizations that address our needs. We can only do the good work we do every day with community support. Can you help us? 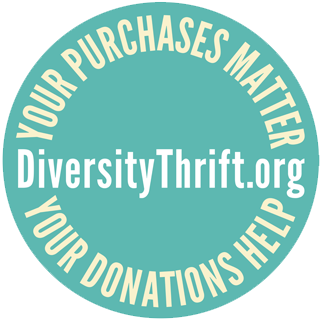 To make a donation on line go to www.DiversityRichmond.org or mail donations to 1407 Sherwood Avenue, Richmond, 23220.